Cincinnati's only overview tour! This 2 mile guided walking tour will introduce you to Cincinnati past and present. Learn about Cincinnati's evolution from frontier outpost to modern metropolis and see the sites, old and new. History, architecture, culture, sports - it's all in this walking tour. The "Meet Cincinnati" Walking Tour begins at the Abraham Lincoln statue in downtown Cincinnati's Lytle Park at 501 E. 4th Street, 45202. 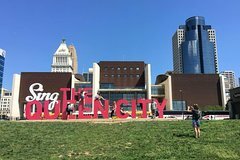 The tour is led by the owner/guide of Cincinnati's Best Walking Tours, a Cincinnati native who will personally greet you and guide your small tour group through the city. We explore the buildings of the 200-year-old Lytle Park Historic District and learn about some of the people who were important in Cincinnati's history. The tour then looks at the architecture of some notable buildings along 4th Street in the Central Business District before heading south to the beautiful Ohio River. Along the banks of the river, the tour takes in Cincinnati's sports arenas and the historic John A. Roebling Suspension Bridge, the riverfront park, the National Underground Railroad Freedom Center, and other developments. The walking tour also includes a visit to sites such as the Carew Tower and Fountain Square. You will learn about Cincinnati cuisine, businesses, arts and culture along the way. A great introduction to everything Cincinnati! The walking tour takes about 2 hours and ends back at Lytle Park.